More on good parenting practices to avoid pitfalls that occur in normal teenage development cycles. Have you ever heard one of these phrases? Maybe you have said some of them yourself, at one point? Then you may have been taking part in enabling parenting behaviors, and unfortunately, these don’t tend to work. If you start patting them on the head and saying it is normal when they do something wrong, you are failing on a fundamental parenting level. Data shows us that the teenage brain is undeveloped in many areas. The primary ways in which it has not yet reached maturity is in controlling emotion and regulating behavior based on logical leaps. In other words, teens are hormonal, moody, quick to fly off the handle and not very good at making decisions. There is nothing wrong with that, it is normal. Our job as parents is to guide them into making better decisions, teach them to control their emotions a little better, and to offer consequences when they fall short of acceptable behavior. What happens if we don’t take that job seriously? Our kids don’t learn those lessons and they don’t have the blueprint necessary to complete those developments. They may come to need much more serious intervention. If not dealt with, they become reckless, out of control adults, potentially continuing the cycle with their own children. Teenage rebellion is common and not a sign that you have done something wrong as a parent. It is a normal part of growing up and necessary for development, something that nearly all experts agree on. However, there is a difference between someone who steps back and accepts that rebellion is normal and a parent who therefore chooses not to address it. Learning consequences is critical for entering into adulthood in a healthy, realistic way. When you fail to instill that lesson, it shows teens that it doesn’t matter what they do, they will get away with that. It is a surefire way to end up with severe behavioral problems that can lead to anything from poor academic performance holding them back, to criminal actions sending them to prison. To avoid these undesirable consequences, parents need to understand how their teenagers’ minds work and discipline them accordingly. Don’t worry, it isn’t too late to reverse this parenting style. What you need are firm boundaries and consistent consequences. It isn’t always easy to enact them, but the reward is worth the struggle. Your child’s future may depend on it. 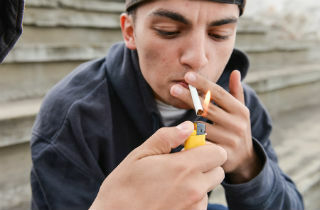 Is teenage drug use on the rise? What Do I Do If My Son Is Dealing Drugs?